~When Ted Thompson conducted his first draft as Packers GM nine seasons ago, in 2005, his first two picks were perhaps his best picks he’s ever made. He first chose Aaron Rodgers, who had free-fallen all the way down into the 20’s, and then in the second round, pick #51, he grabbed a cornerback from a historically black school called Bethune-Cookman, named Nick Collins, and he drafted him as a safety. Nick Collins had emerged as perhaps the NFL’s best safety by the time he helped win Super Bowl XLV for the Packers just over three years ago. He’d only last two more games as his career was unfairly ended in game number two of the 2011 season in Carolina. The Packers have not come close to filling his shoes, either one of them, since then. Ted Thompson has to, finally, invest high in the draft next month to attempt to do this. He ignored the handful of good free agent safeties who could have done this. Collins was on his way to a Hall of Fame career after six seasons, only to see his prime years taken away in Carolina on a fluke play. Now, nine drafts after Thompson drafted that cornerback, there is still a huge void back there at safety. 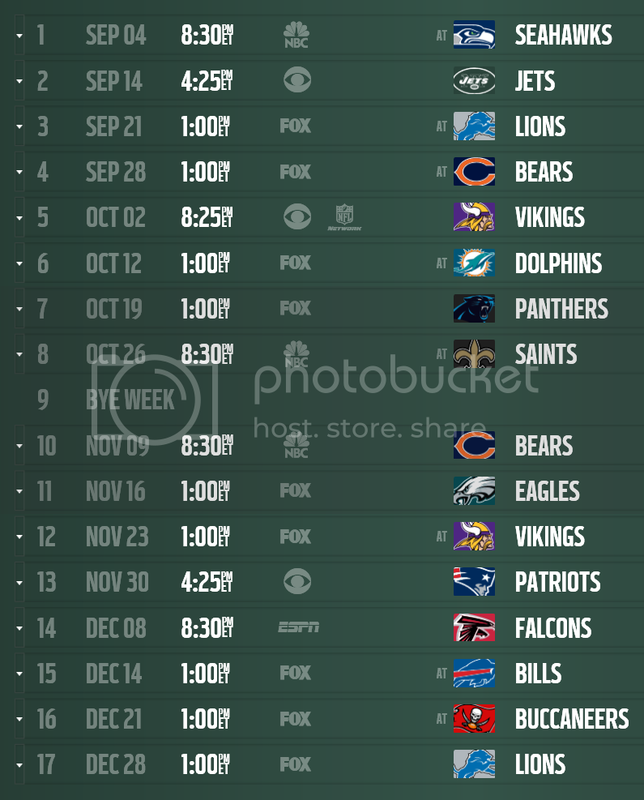 Morgan Burnett is the only legit starter back there, and he was atrocious last season. He didn’t come close to an interception, and he allowed more than his fair share of big plays and touchdowns. He also missed plenty of tackles. Thompson has essentially ignored the safety position since 2011, when Collins’ career ended. Sure, he tried projects like M.D. Jennings, and Jerron McMillian from another football hotbed, Maine. As you all know by now, those experiments failed, bombed, crashed and burned. In the mean time, teams like the Saints (Kenny Vacarro), Seahawks (Earl Thomas), 49ers (Eric Reid), even Vikings (Harrison Smith), invested first round picks on safeties, and saw them pay immediate dividends to their defenses. So here we are, after none of the handful of free agent safety upgrades were brought in, readying for another draft where Thompson has to fill the safety hole. We all thought, wanted him to do that in 2012, and 2013. He chose to ignore it, wishing and hoping that Jennings and/or McMillian would morph into a competent NFL safety. By now, most Packer draftniks are well aware of Alabama’s HaSean Clinton-Dix. Ha-Ha is his nickname. He won’t be around by the Packers pick at #21. And he’s not great enough to warrant the rare trade-up anyway. Cross him off. The next highest rated safety, according to about 95% of the analysts and draft experts, is Calvin Pryor from Louisville. There’s about a 30-40 percent chance he will be there at #21. Calvin Pryor would be the ideal pick for the Packers at #21. But there’s a good chance he will be gone by then. He offers up the physicality that the whole Packers back end lacks, and has lacked since Chuck Cecil tried to knock people out back in a day it wasn’t “as illegal”. He has the physicality that the Packers defense lacks on the back end. For as good of cover guys as Tramon Williams, Sam Shields, Davon House, Casey Hayward, they aren’t physical and have never been accused of causing opposing receivers to hear footsteps. Same with Burnett. In that regard, Pryor would help tremendously. But since there’s a strong chance that Pryor will already be gone (probably to Chicago, Dallas, or Baltimore), let’s take a look at some guys who will be available. Remember, Thompson, and his former protege John Schneider in Seattle, have had success drafting safeties who have been rated as cornerbacks. Both Nick Collins and Earl Thomas were projected cornerbacks. Earl Thomas is considered the best safety in the game today, and he was not even rated as a safety when he was coming out of the University of Texas in 2010. As great as he is, he’s not perfect, as Darren Sproles showed here last year. And Thomas’ combine numbers, measurements were not off-the-charts. It was a great pick by John Schneider. Let’s take a look at a few of the possibilities for the Packers. *Collins entered the NFL on April 23, 2005 when he was selected in the second round (51st pick overall) of the 2005 NFL Draft by the Green Bay Packers. Collins would become only the second Bethune-Cookman player to make the Packers roster. Some draft experts felt that the Packers drafted Collins too high, referring to him as “a developmental prospect who is very athletic but very raw” and questioning his ability to fully grasp an NFL-caliber defense. Though he was listed as a cornerback in the draft prospect list, Collins competed in Green Bay for the starting free safety job for the 2005 season. ~If there’s one position that GM Theodore Thompson seems to draft well, it has to be the wide receiver position. And he does it differently than other GM’s. While others flock for the big school, big name receivers like LSU, USC, Ohio State, the Charles Johnsons, the Chad Jacksons, etc. Thompson assembled the NFL’s best corps from schools like Western Michigan, San Jose State, Kansas State, Kentucky, Alcorn State (not his draft pick though), Virginia Tech. Saginaw Valley would fit right in there. Jeff Janis has legit speed. But opposing cornerbacks also are often caught off guard by that speed, as he runs past them. With Jordy and Boykin on the other side, Randall Cobb in the slot, and Eddie Lacy in the backfield, you think Aaron Rodgers could take advantage of Janis being isolated on a slower and smaller cornerback? Jeff Janis rewrote the record books at that small school. At 6′ 3″, 219, he’s very similar to the Packers own Jordy Nelson. Both guys have very good speed, but it’s “deceptive” -for some reason. The elephant in the room is that each player is white, which apparently means they aren’t supposed to be able to run by all the non-white cornerbacks in the NFL. Jordy and some of his teammates have touched on that “taboo” subject in the past few seasons, as Jordy climbed from role player into Pro Bowl performer by running past DB’s and scoring long touchdowns. They’ve felt that Nelson was able to use that “surprising speed” to his advantage as he was able to get past the corners and behind the safeties. Now that Jordy has done that so many times, he’s earned the respect of the coverage, which has helped open up the shorter routes. Janis is very similar. As his production in college, and his combine numbers show, he has the speed, agility, and size to get past and above NFL defensive backs. A is Janis, while B is Jordy Nelson. Not clones, but Janis’ numbers are actually a bit better than Nelson’s. Don’t think Ted Thompson hasn’t noticed this. Nelson is entering the final year of his contract, as is Randall Cobb. Thompson and company have every intention of keeping both guys. But keep or lose Nelson, adding Janis would be a good move for the Packers, and one I would not be surprised to see happen in two weeks on Draft Weekend. Janis is projected to go anywhere between the third & sixth round. NFL Draft Scout/CBS Sports pegs him as a round 5/6 guy. I expect someone like Thompson take him in the third round, either with his #21 pick or his comp pick that he got for the Vikings overpaying for Greg Jennings last year. Janis scored 45 touchdowns his final three seasons for the Cardinals. He did that in 34 games. STRENGTHS: Looks the part with a tall, muscular body type. Has worked hard to fill out his frame. Fleet of foot with very good build up speed to accelerate away from defenders. Controlled routes and shifts his momentum well with smooth footwork in/out of his breaks. Good hesitation to sell patterns. Good tracking skills and judgment on deep throws. Solid functional strength for the position, making it a chore for tacklers to finish him off. Strong competitor with an intrepid, fearless approach to the game. Very tough and holds onto the ball after jarring hits. Ambitious worker with strong intangibles and excellent character on and off the field. Try-hard player who gets the most out of his ability. Productive resume (37 career starts) with back-to-back 1,500+ receiving yard seasons the past two years. Holds the school record for single-season receiving yards (1,635), single-game receiving yards (300) and single-game catches (18). If those traits don’t remind you have a Ted Thompson pick, then you haven’t been paying attention for the past decade. The only problem for the Packers here is Janis has caught the eyes of more GM’s than Thompson, and they will have to pull the trigger on him earlier than those draft “experts” are saying. That’s good for Janis. And he can, perhaps, thank fellow elephants Jordy Nelson, Eric Decker, even Wes Welker for him getting more advanced credit. ~Ever since Nick Collins was unfairly taken away in 2011 in his early prime, the Packers have had a gigantic hole on the back end. Fans and NFL analysts alike expected the Packers to draft a safety early in the next draft, 2012. Everyone knew Thompson would not go after an unrestricted free agent, so it appeared obvious Thompson would use the draft to fill that massive hole. He did. Well, sort of. He waited until the fourth round when he grabbed a guy very few had heard of in Jerron McMillian from Maine. Many fans who were involved with mock drafts that spring were hoping for safety Harrison Smith from Notre Dame to be the pick, but when #28 came around, Thompson grabbed DE>turned>OLB Nick Perry instead. The Minnesota Vikings had the next pick, and they did select Smith, who was an immediate upgrade to their defense and was an All-Rookie. The 2012 Packers defense would, quite honestly, have been much better with Smith than they were Perry. Partly, in all fairness, was because Perry missed most of the season with an injury, while Smith was healthy. Smith did miss most of his next year though, 2013, with his own injuries. And Perry was hurt again. 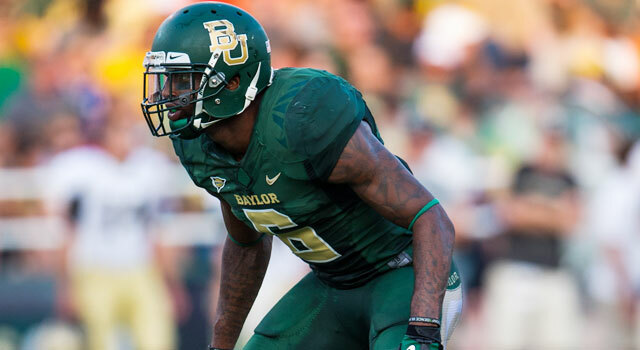 Last draft, fans and pundits again expected a safety to perhaps be the Packers’ pick at #26. Two were possibilities as Matt Elam from Florida, and Johnathan Cyprien from Florida International were graded as 1st rounders and were available. But Thompson again chose the larger man as he went DL with UCLA’s Datone Jones. Datone might yet pay dividends, as might Perry. Thompson eventually ended the draft with no safeties selected at all, gambling that McMillian or M.D. Jennings was going to make that “second-year jump” that he and Mike McCarthy have a patent on. Elam did go just six picks after Datone, at 32 and Cyprien next off the board at 33. Elam ended up being drafted by the champion Ravens, and it was he as a rookie last year who broke Randall Cobb on the legal, but cheap, hit into his planting leg when the Packers played at Baltimore. So here we are a year later, and the hole at safety is bigger than ever. Thompson, unlike Denver (TJ Ward) and New Orleans (Jairus Byrd) and New England (Darelle Revis) didn’t bolster his secondary by adding a free agent, so it will be Draft-or-Bust if the safety hole is to be finally, properly filled. Let’s take a look at a few possibilities. Again, with Thompson, you never know. You can’t be surprised if he grabs a guy from a small school like Maine, Bethune-Cookman (Nick Collins), or if he goes big powerhouse school like USC (Clay Matthews) or Alabama (Eddie Lacy). Ha-Ha Clinton Dix, Alabama, figures to be long gone by the Packers first round pick. The consensus top two in this draft are HaSean Clinton-Dix from Alabama, and Calvin Pryor from Louisville. A small handful of people think Northern Illinois’ Jimmie Ward is better than Pryor. Clinton-Dix, 6-1, 208, 4.58 forty, is more of a free safety, who reminds me of Byrd a bit as he’s a guy on the back end. He doesn’t have blazing speed though. His speed was exactly the same as Pryor at the NFL Combine. Calvin Pryor, Louisville. The Packers secondary hasn’t had a physical element like this since, perhaps, Chuck Cecil in the late 1980’s. Pryor, 5-11, 207, 4.58 forty, is an aggressive, hard-hitting safety who reminds many of Harrison Smith and Kenny Vacarro, who was the Saints number one pick last year and injected some physicality to that defense last year. 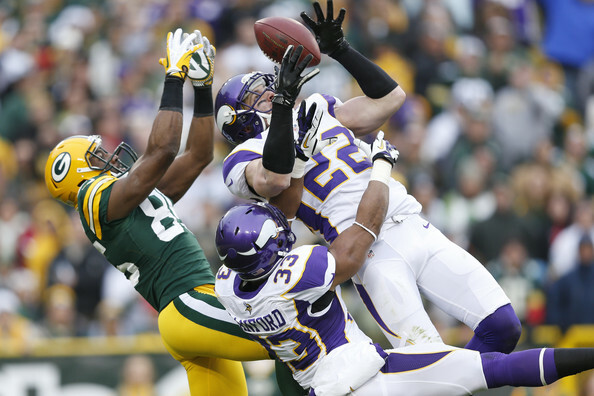 The Packers secondary hasn’t been accused of being “physical” in quite a few decades. Pryor might be the perfect prescription to that. Pryor knocked out guys last year in three straight games. Ward is 5-11, 193, and ran a 4.48 at the combine. I’ve heard the Earl Thomas comparison to him, but I see more of Thomas in Pryor. Still, there’s no doubt that Ward would be an upgrade over anything on the roster currently besides Burnett. Some analysts have Jimmie Ward as the number-two rated safety. He probably will sneak up and be a somewhat-surprising late first round pick. By the Packers perhaps? Ed Reynolds from Stanford tested as close to a clone to Clinton-Dix as you could find at that combine. He measured in at 6-1, 207 with a 4.57 forty. Just because the magazines and Kiper, McShay, Mayock, and others have Reynolds so much lower, doesn’t mean Thompson does. Reynolds is a projected 3rd/4th round pick, but don’t be shocked to see Thompson take him in the 2nd or 3rd round. I suspect if Reynolds had done what he did and was from Alabama, he’d be rated higher by the national pundits. Thompson doesn’t get fooled like that, and Thompson has drafted a lot of players from the West Coast (Rodgers, Matthews, Perry, Datone, Jonathan Franklin, James Jones, Desmond Bishop to name a few). Ed Reynolds, Stanford. He had a bunch of interceptions two seasons ago and once he got his hands on the ball, expected to score. He did so three times. Although Thompson hasn’t drafted any Stanford players as Packers GM, I would not be surprised to see him take Reynolds late on day-two. Florida State’s Terrence Brooks is faster (4.42 combine) than all of them, and at 5-11, 198, has similar size as Pryor and Ward. He’s pegged for the 3rd round by most at this time. But again, Ted Thompson has his own grades which are always much different than the pundits we are reading about from January til draft day. Washington State’s Deone Bucannon measured in at 6-1, 211, with a 4.49 forty. Bucannon has the best blend of size, speed, and game tape of all the safeties. Bucannon can go get the ball. Bucannon can hit and knock the ball away. Craig Loston, LSU, 6-1, 217, 4.63. Brock Vereen, Minnesota, 6-0, 199, 4.47. Ahmad Dixon, Baylor, 6-0, 212, 4.64. 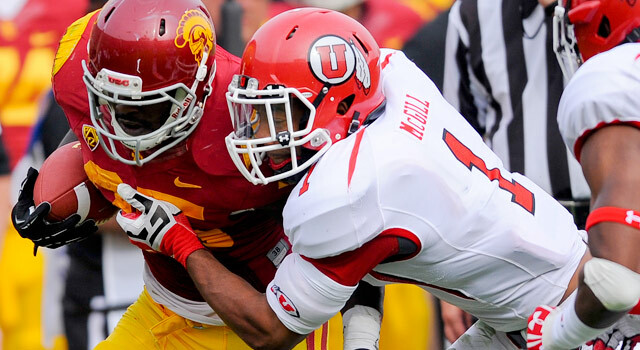 Dion Bailey, USC, 6-0, 201, 4.66. Dontae Johnson, NC State, 6-2, 200, 4.45. Kenny Ladler, Vanderbilt, 6-0, 207, 4.70. 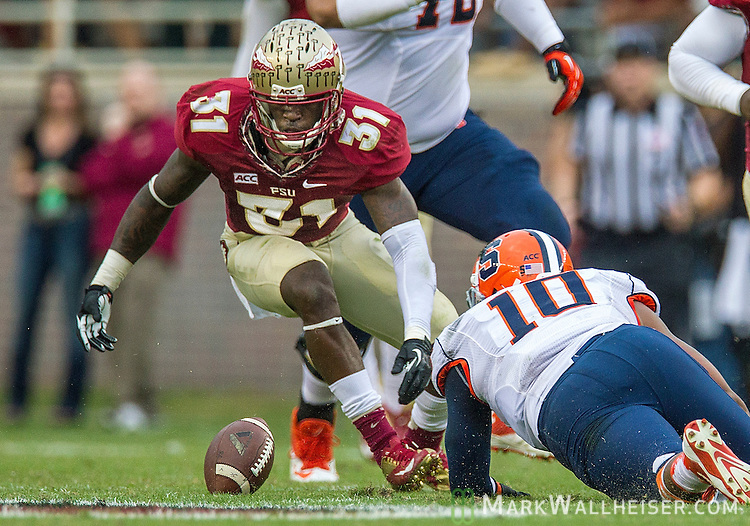 LaMarcus Joyner, Florida State, at 5-8 is too short for Thompson so I feel you can cross him off the list. A sleeper to watch for is speedster Dezmen Southward from Wisconsin. At 6-0, 211, he blazed a 4.38 forty at the Badgers Pro Day in March, and leaped an NBA-like 42″. Only five safeties tested in Indianapolis at this year’s Combine recorded a 40-yard dash under 4.50 seconds. Of the group, only Washington State’s Bucannon recorded a similar time (4.49) while possessing a similar frame (6-foot-1, 211 pounds). Southward is a better runner and athlete than he is football player. So far. But some team might grab him earlier than expected because you can’t teach speed like that. Sam Shields is proof of that, and even he went undrafted somehow. Jerry Gates, Bowling Green, 5-11, 203, 4.56. Darwin “Cookie Monster” Cook, West Virginia, 5-11, 203, 4.58. Shamiel Gary, Oklahoma State, 6-0, 205, 4.53. Maurice Alexander, Utah State, 6-1, 220, 4.54. Jonathan Dowling, Western Kentucky, 6-3, 190, 4.52. Ty Zimmerman, Kansas State, 6-1, 202, 4.57. Troy Polamalu, Ed Reed, Nick Collins, Earl Thomas and Kam Chancellor, DaShon Goldson, Eric Reid. It seems one thing that championship defenses have in common is they are strong on the back end at the safety positions. Thompson had that with Collins and young Morgan Burnett. But since Collins’ career was taken away from him, the back end has been atrocious and that has to be fixed finally. Whoever Thompson does draft, and I think he should draft not one but two safeties, he has to be right this time. When you rely in the draft more than any other GM does, if he wants to get this team back into the Super Bowl there can be no more missfires like McMillian and MD Jennings. He has to find a good safety next month in the draft. ~AJ Hawk was the fifth overall pick in the 2006 NFL Draft, Mike McCarthy’s first as Packer head coach. Last year at this time, Super Bowl champion Baltimore replaced Ed Reed with Michael Huff. It was a move Ozzie Newsome felt was a good one. However, the Ravens opened the year at Denver and Peyton Manning threw an NFL-record 7 touchdown passes against the Ravens defense. Huff didn’t work out and the Ravens had a bad year overall. Huff was released later in the season and picked up by the Broncos. He saw action in the Super Bowl. He could now be added for less money than what the Packers pay Morgan Burnett for one month of work. Among the other players who were strongly considered for that pick were current 49ers tight end Vernon Davis, Baltimore Ravens defensive lineman Haloti Ngata, and former Longhorn safety Michael Huff. The Packers, of course, took Hawk with that pick. The other guys went in the picks soon after. Huff went 7th. Davis went 6th. Davis and Ngata have become stars and have appeared in Pro Bowls. Hawk has not lived up to those lofty expectations. But he’s been the most healthy and available Packer since he was drafted. What about the safety, Huff? Michael Huff once had elite ability. A very rare blend of speed and size. Well, he was a disappointment in Oakland. He played seven seasons in the black hole. But he did only miss four games in seven years. Last year, he split his time between the reigning Super Bowl champions the Ravens, and the new AFC champion Broncos. He’s currently a free agent, and could be had for the veteran minimum easily. He would not command any significant signing bonus or guaranteed money. He’s allowed some touchdowns and completions. But he also has made some plays, and still has exceptional athletic ability. For what he did in college, at a big time program, and what his skills, combine times and measurements were, he’d again be the easy, clear-cut top-rated safety if he were entering this draft. But something happened in Oakland and last year where he didn’t make the jump that everyone, I mean all the scouts and analysts, expected. I believe if coached up in Green Bay, Huff would be a huge upgrade at starting safety along side Morgan Burnett than anything the team had last year next to Burnett. His final four seasons in Oakland, 2009-2012, he had at least two interceptions each season. And that was behind a bad defense on a bad team who was trailing most of the time and didn’t have to pass much. Remember, the combined number of interceptions the whole Packers cast of safeties had last season was zero. Nada. Nothing. Huff is also a capable blitzer, as his 2010 season with four sacks shows. Giving Huff a chance certainly couldn’t hurt anything. He’s a talented and athletic player, who has no significant injury history. He was talented enough that him being a top-ten pick in that 2006 draft was a seemingly safe pick. 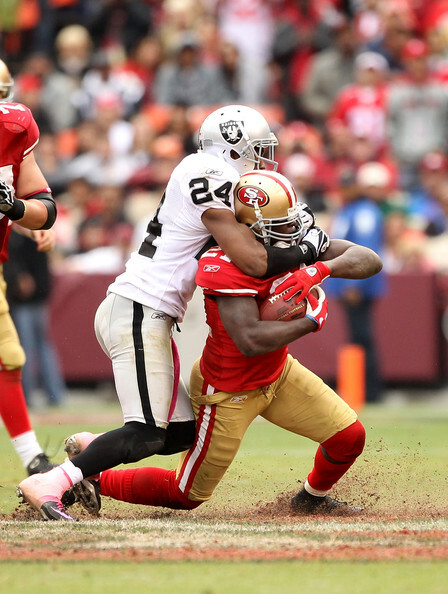 Here Huff makes a solo tackle on Niners runningback Frank Gore. Much like the 49ers have recently added former first-round “talents” on the cheap (or not so cheap) from other teams in: Donte Whitner, Glen Dorsey, Ted Ginn, Carlos Rogers, Ahmad Brooks, Justin Smith, and Anquan Boldin, there’s little risk and high reward possible. Michael Huff beats Mike Wallace and picks off an end-zone pass from Ben Roethlisberger two seasons ago. Huff has played badly. He’s been beaten on passing plays. Huff might not provide anything to the Packers. But he won’t cost much and he could, perhaps, blossom in Dom Capers’ defense and add something on the back end. Huff beats Julio Jones to the ball and intercepts a Matt Ryan pass in a game a few years ago at the Georgia Dome in Atlanta. There’s absolutely no reason Ted Thompson shouldn’t at least bring Huff in for an extended look.